WW1 Reenactments Equipment : Great War Tommy WW1 Food Rations Labels : Bovril Chocolate wrapper, circa 1900. WW1 Reproductions and WW1 Reenactors Equipment / Kit - Bovril Chocolate wrapper, circa 1900. 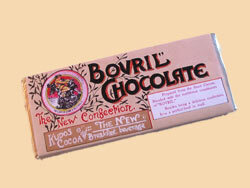 "Bovril" Chocolate wrapper, circa 1900. Early type wrapper for the unusual "Bovril" flavoured chocolate produced by Bovril Ltd.(London) Ideal as a gift for those on "Active Service".